Gulai Ikan Patin - Enjoy eating a delicious dish servings can make us happy. There are many delicious foods. This article will give you the information about the recipes to make gulai ikan patin. 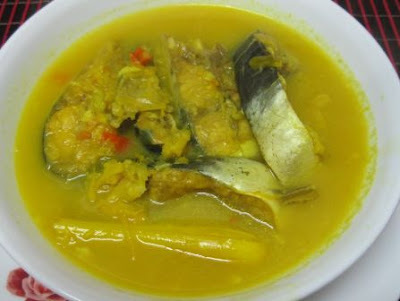 Gulai Ikan patin is a foofd which is popular in Jambi, Indonesia. The gulai ikan patin is cooked by using tempoyak which is durian flesh that has been fermented. But there are some people who choose to replace tempoyak with coconut milk to avoid the small and taste tempoyak is adequate to sting. As well as other spices used in soups tempoyak catfish manufacture is red pepper, garlic , turmeric, galangal, lemon and onion. Hearts initials of this recipe are using ikan fatin. Ikan patin looks like a catfish. It has a mustache. Ikan patin is very tender and it has a mushy texture. The texture of ikan patin is mushy, so that it can be cooked as gulai very well. 2 fresh ikan fatin with the standard size. 2 pieces salam leaves, wash and clean. A half of coconut watery milk. Lumpy coconut milk 200 ml. The serai of 2 cm, then mashed. 1 piece lemon. Make it a half. Half a teaspoon of pepper powder. Turmeric size of 3 cm and grill it. Cut the fish according your tastes. Eliminste the part that is not required and clean it . Boil it to saucepan, layer the fish with the lemon juice and salt. Let it stand for 10 minutes. Heat the 3 tablespoons of oil in a frying pan. Then stir spices mashed. After the Gulai ikan patin smells good, add the salam leaves and stalks lemon too. Also inputs the salt, sugar and condensed milk. Cook it until boiling. After that, put the fish, let it till mature. Pour the coconut milk. Cook until the sauce is thickens. Put the celery and tomato slices. Finally, the Gulai Ikan Patin can be served.